When gunk, leaves and debris are blocking the downspouts from directing water away from your foundation, you could wind up with unrepairable structural and eaves trough damage. Clean all debris out by hand, ensuring nothing is overlooked. Flush water through each downspout to make sure no blockage occurs. Snake downspouts to loosen any remaining leaves or debris. Compost or place leaves in yard waste bags. Use padded ladders to protect your eavestrough. An inspection of your roof while we're up there. 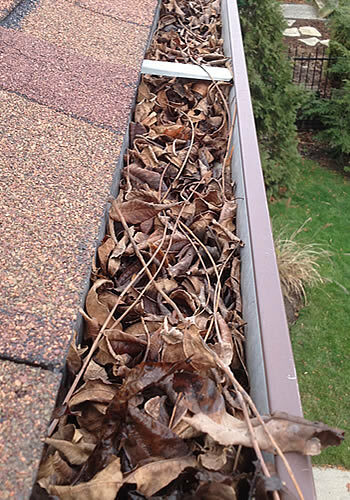 Climbing up on a roof using ladders can be extremely intimidating for inexperienced homeowners, that’s why so many call Accurate in the fall or spring to make sure their eaves troughs are cleaned out and working properly. 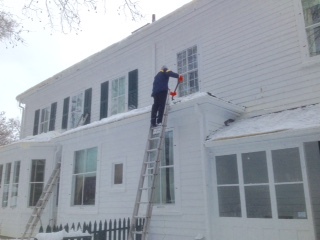 Roof Raking & Ice Dam Removal .